Founded in 2002, Elian’s British School La Nucía is a co-educational private day school for children from 1 to 18 years of age, located in La Nucía (Alicante). It is part of the Iale-Elian’s Educational Group. Elian’s British School La Nucía follows the British National Curriculum complemented by the obligatory Spanish curriculum. We accept students from 1 year of age upwards and include the Doman -inspired pre-school stimulation program with learning and stimulation techniques for accelerated development of intelligence. We provide strategies for developing the students’ full potential intellectually, emotionally, socially and physically, including the ability to think for themselves. Our students begin the acquisition of the English language between 1 and 2 years of age and from 3 years upwards they follow the British National Curriculum with the statutory Spanish studies. In the Secondary and 6th Form departments, students sit IGCSE and A / AS Levels examinations. All our British staff hold UK teaching qualifications. The primary school is fully authorised and follows the Foundation and Key Stage 1 and 2 British Curriculum delivered by fully qualified British teachers. This is supplemented by the statutory Spanish subjects taught by fully qualified Spanish teachers. There is also a full–time classroom assistant until the end of Reception. The secondary school opened in September 2005 and is fully authorised. In Key Stage 3 the students follow the British National Curriculum supplemented by the statutory Spanish subjects. At Key Stage 4, IGCSEs are offered in a range of subjects and the school is an examination centre for CIE Cambridge International Examinations and EDEXCEL. Key Stage 5 was founded in September 2007 and is fully authorised. Students benefit from a wide choice of AS and A level subjects with personalised programmes of study. The 6th form programme also includes a comprehensive programme of Spanish studies. Classrooms with indoor and outdoor gardens; science laboratories; computer suite; library, art room; dining rooms; Auditorium and conference rooms; swimming pool; 5-a-side football pitch; basketball court; tennis courts; infant gym; coffee shop; boutique. Close monitoring of students and frequent reporting to parents; individual learning plans for students if required; open on non-teaching days for a minimum of 10 students; extended hours for working parents before and after school; educational psychologist; extra English and homework classes; support classes for children with difficulties in any subjects; optional school transport; chef who prepares a freshly cooked lunch in our school kitchen. The summer school runs during July. We offer re-enforcement and revision classes and the means to learn or improve English language skills through fun activities such as arts and crafts, fashion design and sporting and cultural activities. During summer school we also offer daily swimming lessons. 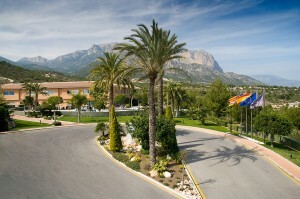 The school is located in La Nucía, near Benidorm and close to the city of Alicante. It is set in beautifully landscaped grounds covering an area of 25,000 sq. m with top class sports facilities including a swimming pool and gymnasium. Elian’s offers a wide variety of extra-curricular activities taught by fully qualified staff. These activities take place during lunch break and after school. Clubs include football, tennis, dance, basketball, swimming, hockey, drama, music, arts and crafts, computers, chess, etc. Parents or guardians of prospective students are required to make an appointment with the head teacher. All prospective students from Year 2 upwards are required to sit an entrance exam in English and mathematics. Parents or guardians are also required to provide a copy of their child’s most recent report from their previous school. We reserve the right to refuse admission based on the above requirements.